Stories illustrated by Bryan Prindiville. Fact: Like magpies, clowns covet shiny objects. It is with profound apologies that we bring you this mini-issue, Issue 11.5, known amongst the initiated as The Journal of Unlikely Coulrophobia. Last year on this date we launched our first April Fools issue, The Journal of Unlikely Story Acceptances: intentionally bad stories by good writers. We expected this year’s sacrifice offering to be likewise light-hearted. Clowns have proved to be an unexpectedly fertile ground for authors to explore not just silliness and horror, but so much more. 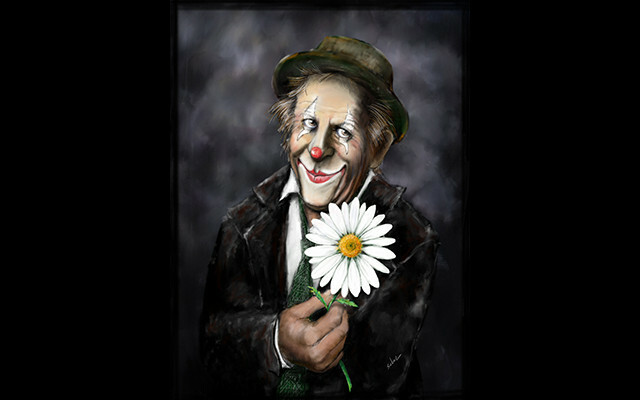 In the exaggerated greasepaint features of the clown we find reflected none other than ourselves, the internal made external, both our internal beauty and our hidden evils. they go all the way back. Rarer clowns have baleen, but it isn’t the krill they strain. In 1970 my parents moved to the Philadelphia area. I was five. New house, new bedroom, new bedroom furniture. New school. New baby brother. A lot of upheaval and anxiety. Somewhere in there, my parents decided that I needed something fun for my room. They bought a huge picture of a brightly colored, grinning clown. I hated it. My parents didn’t believe me, and hung it anyway. I woke screaming throughout the night. My parents were not dissuaded: money was an issue, and this expensive picture was going to bring me joy whether I liked it or not. Fact: Clowns can remove their bones at will. and how they slip under your door. After none of us slept for days on end, I won that argument. Still, I remember that damned thing watching me as I slept. Maybe that’s why this issue exists. Despite this formative moment, we weren’t looking for generic evil-clown stories. Yes, we love Tim Curry, but it’s more for how he fills out a corset than for his greasepaint. We were, frankly, overwhelmed with the number of stories that came in that tickled our funny bone while simultaneously tearing out our hearts, that made us laugh and shudder at the same time. We couldn’t possibly publish them all here. But we also couldn’t bear to let these stories go. Which is why we’re putting out an anthology. 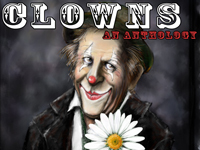 Yes, that’s right, an anthology of clown flash fiction. And by “we are” I mean, “we are trying to.” The Kickstarter project for this anthology is (hopefully) launching today, and running for 30 days. If it’s funded, we’ll have our first ever print book, possibly the first ever anthology of clown flash fiction in the history of the world, featuring these stories, the stories we love but couldn’t fit in the issue, and an open call for additional submissions. You know you want this. Don’t listen to reason. Listen to the thing under the bed, the thing hiding in the closet, the thing that softly honks in the darkness, and visit our Kickstarter page now.